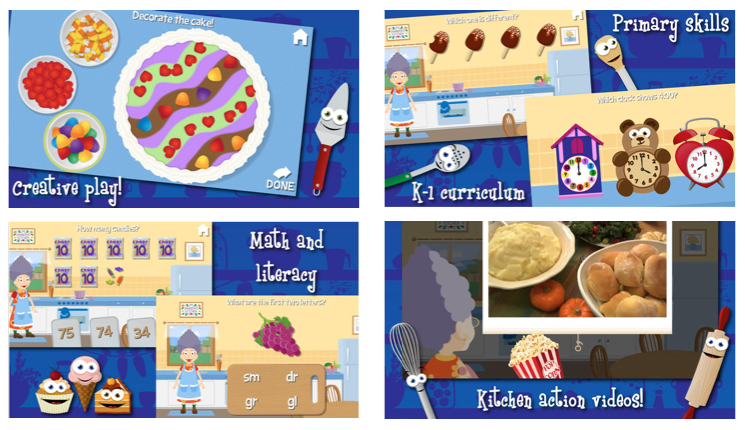 Grandma’s cooking up a storm in this fresh-baked app that stirs kindergarten and first grade skills into the batter. Kids can “bake” compound words, make and decorate a cake, tell time to see when the cake will be ready, and even help Grandma wash the dishes. Reading, math, and pattern-recognition are seamlessly integrated into eight fun mini-games, and live-action instructive cooking tips add to the deliciousness. Customize the games to choose which skills to activate. So hide the knives and step aside – your eensie-weensie Emeril or junior Julia Child will be whipping up dinner – with a side of reading and math! Download it here for only $0.99. This looks like an adorable app for the kids to play with. My son is constantly downloading apps. He always wants something new, even if we have over 30 apps installed. I think this is great because it is fun and he is learning something at the same time. Plus it is on sale. It is normally $1.99 but now going for $0.99. That's a good price for an app. Do you have a child who would love this app? If anyone has tried it, leave a comment.